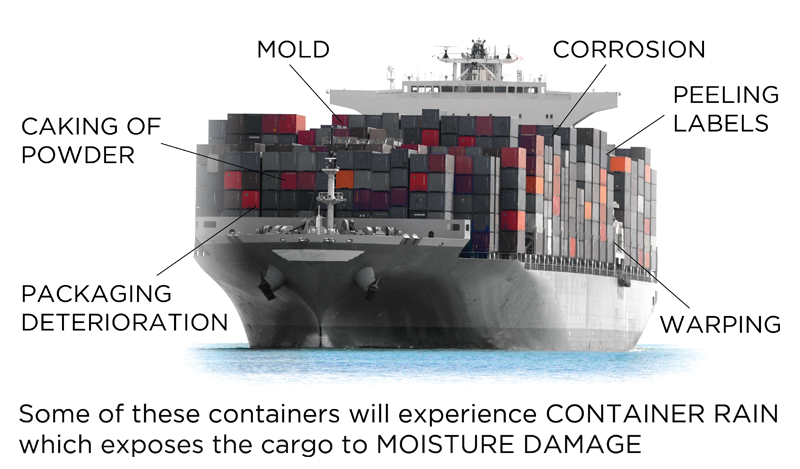 Clariant's Container Dri® portfolio offers a broad line of container desiccants that offer versatile protection against damaging humidity and moisture during intermodal transport. Available in bags, poles and strips, these industry-leading products absorb up to three times their weight in moisture, and trap it as a thick gel that will not spill or drip. This system is highly effective in preventing the conditions that may cause mildew, warpage, corrosion, caking and other damage to agricultural products, bulk foods, powders, wood products, glass, furniture, automobile parts, leather goods, beans such as cocoa bean, and coffee bean, machinery and metal components. Container Dri®II cargo desiccants can help manufacturers, shippers, distributors and other stakeholders protect brand equity, maintain their reputation for quality and safeguard revenues.